Rating: Appropriate for most readers, probably boring to littl'uns. Disclaimer: Most of the dialogue was written by the uncredited ghost writer on BATMAN #633 who actually knows how these characters talk. All of the characters belong to DC Comics. Spoiler warnings: Set during BATMAN #633 (War Games Act Three Part 8) and full of spoilers for that issue. Also contains some general spoilers for the War Games storyline and "As the Crow Flies" (BATMAN #626-630). Author's notes: Also features Catwoman, Onyx and Tim Drake reprising his role as Robin. "Set up a perimeter," Batman had ordered us. "Any normal thugs that come out -- Leave them for the cops. Any metas -- You'll need to find some way to take them out without becoming targets yourself." Then he had swung onto the clocktower roof in the shadows between the helicopters' searchlights. We had only just begun to spread along the roof, preparing to take up position on other rooftops opposite the clocktower where Black Mask had Barbara hostage. Then we heard the muffled thump of an indoor explosion. From the clocktower. Onyx and Robin, at the corners of the roof, looked at me and each other. I turned to the clocktower and saw some of the front windows were cracked and smoking faintly. A moment later -- now -- someone is yelling. "Paint the streets red with his blood!" The yelling is loud and strange. The front entrance of the clocktower is thrown outward and smoke comes out. Out of the smoke comes the Scarecrow. Not Jonathan Crane, but the monster he turns into. Most of the police officers on scene are right in front of the entrance. Right in front of the scarecrow creature. It scoops two of them up in its giant claws. "KILL EVERYONE!" It throws the two cops aside and grabs for more. The police don't know what to do. They shout and fall back and start shooting. More shouting, and the police cease fire. They don't know how to fight it. They're nothing but targets to it, and now its attention is on them. I look at Robin, hoping he has a tranq gun with him, but if he did he would have used it already. Onyx, Tarantula and Catwoman have not fought this creature before. They are waiting for us to brief them. Below, police officers are screaming and maybe dying. "Let's go," I say. "We've got to stop that thing." Catwoman snorts. "How? We'll be gunned down by the cops in the first second." "I've got an idea," Robin says. He is frowning. "You four go after the creature, while I create a diversion." He is going to lie. Robin is very good at using words to lie. He is even good at using his body to lie, good enough that most people are fooled. He sets a line and jumps off the roof. He is trying to do it the way Nightwing does, but his form is only good, not perfect. "I'll join you after I get the cops off our backs," he calls back over his shoulder. The police will be angry after they realize he has lied to them, and they will trust us even less. But they already don't trust us now. It is a good tactic. The four of us look at one another. Catwoman... Catwoman usually works alone. Right now she likes the idea of working with us. Her face is stern, but her body is smiling. Tarantula thinks she can lead the attack, she just doesn't think the rest of us would listen to her. She's eager. Too eager. She wants to prove herself. But she is holding herself back. I point to myself. "Up," I say. Then I point to Catwoman, Tarantula and Onyx in turn. "Left. Right. Down." I step onto the edge of the roof, and the others follow me. Robin has reached the street. He is holding his hands out in a way that can easily be turned to an attack but which most people interpret as peaceful intentions. We leap at the scarecrow monster. "All sides at once!" I say. Onyx is so close behind me she's almost beside me as we fall. "Hit him!" Catwoman says, aiming a kick on her way down. It is interesting that she seems so happy to be fighting with us. Even with Batman she is not usually... a team player. Tarantula is still holding back. She is last off the roof. Her blades are out but her body says she is not ready. Not afraid, something else. This time the creature does not seem to infect people near it with fear toxin. One good thing. Onyx and I punch both sides of its head. I stay on its shoulder to keep hitting and give Tarantula an opening while Onyx jumps down. Tarantula has landed on a ledge on the building just above us. She is watching us to see how we work together.Only Catwoman and I have fought together before but she does not know that. Catwoman dodges from one place to another on its leg, kicking and punching its torso trying to find a weak spot. Tarantula leaps onto the other leg and cuts at it but only makes straw fly loose. Onyx is punching at its midsection, weaving between and around its legs. I keep hitting it in the head, trying to at least keep it distracted from harming the others even though it does not seem to have weaknesses at the strike points where a human would. I cannot read its body language, except that it seems enraged. Tarantula has switched to elbow thrusts. I think she tried stabbing the creature but it must have done no good. She has herself braced with one foot on its thigh and the other on its knee. The thing raises the arm above Tarantula to claw at me. I just punched its eye... maybe that's a vulnerable spot after all. Or maybe it just decided swiping at Onyx wasn't working. I dodge around its shoulders. Below me, it swipes at Catwoman as she is aiming another kick. I stomp on its shoulder. Tarantula throws herself at the other arm, using her body weight to keep it from attacking effectively with that limb. Robin is moving to join us. His plan to trick the police has worked. Catwoman drops down to avoid the arm still reaching for her. Onyx kicks the knee Catwoman had been on hard enough to make it stagger. I let its momentum throw me forward, tumble and land behind Catwoman. She jumps up and lands hard on its hand, pinning it to the ground before it can grab for either of us. Then she runs up its arm to its shoulders and swings her doubled fists down on its face. It roars and flings Tarantula off its arm, and bats Onyx away with the other. Lucky for her it is backhand and the claws do not cut her. I realize when I see the whip lashing that Catwoman has stabbed it in the eye with the handle. The explosion is so close, at first I think it is lightning and an earthquake. Then flame boils out of the clocktower's upper floors, and concrete and glass and things on fire begin falling down on us. Barbara, is my first thought. Even before, get out of the way. But we have to get out of the way. "Get back!" I shout over the noise. The others are already moving. The scarecrow beast doesn't seem to know which way to go, and then little bits of fire land on its arms and head and begin to catch. It brushes and slaps at the places where it is burning, distracted from stopping us as we pass. Robin is veering to meet up with us, moving away from both the building and the police. Then the building explodes again. This time most of the blast must come from ground level, because it knocks me through the air and I land hard. I push myself up quickly. Robin is beside me on one side, Tarantula on the other. Around the building, Robin gestures. Away from the direction the police are retreating. Over my shoulder I see that the scarecrow monster has also been knocked down and away by the explosion. If it is unconscious, it will return to being simply Jonathan Crane. Still dangerous, but not in the same way. My ears are ringing. Probably all of ours are. I nod at Robin and we continue our retreat. When we have reached a safe distance and some cover, we turn and look. The clocktower is collapsing in on itself. But... it doesn't look like Batman or Black Mask brought these explosives with them. The pattern is wrong. This looks like when buildings are destroyed on purpose so a new one can be built. "Pro demolition work?" Onyx asks from behind me. Her voice still sounds faint. It will probably be hours before my hearing is back to normal. But that is the word I could not remember: demolition. Robin crosses his arms under his cape. He is concerned for Barbara and Batman both, but he knows there is nothing we can do yet. The building is still settling and still burning. On his other side, Catwoman is also concerned. She looks like she wants to twitch a tail she does not have. But there is a calm in her, too. She trusts Batman to get out safely. And she trusts herself to handle it if he doesn't get out safely. Tarantula is also behind me, but not so far I can't see her if I turn my head just a little. And she is also concerned. Not for Batman, not because of how important the Bat is. That's what Onyx is probably thinking. Not for innocent victims who might have been in the building, except as much as we all are. It's... someone she has what Stephanie would call "baggage" with. Someone she knows. There is something she feels guilty about and she doesn't want to have lost her chance for... revolution? No. Resolution. Even though she doesn't know how to get it. The police cars that are not too damaged are moving back. I think I can hear a siren from a fire truck. I hope it is close and that it is coming here. I hope Barbara and Batman are not hurt. Or dead. I wish I knew how to pray. Right now it is the only thing I could do that might help. Tarantula moves her arm across her chest like I have seen Huntress do. The sign of the cross. I hope she is praying enough for me, too. The fire is already burning itself out. "We need to check for any of Black Mask's men who escaped the building," Robin says. "And make sure Crane isn't mistaken for an innocent bystander by the cops or the EMTs." He looks at the four of us in turn and adds, "None of you has to come." The police are still in the area, but none of us are ready to flee when we might still be needed. This time, Tarantula steps forward first. "Let's go, then." Whoever she was concerned about inside the clocktower... it wasn't anyone in Black Mask's gang. If anything she is looking forward to hurting any of them we find. Catwoman and Onyx come with us, too. I spot Crane as soon as we reach the corner. He is facedown on the pavement beside one of the police cars that was ruined by the first series of explosions and left behind. Robin also sees, as I am about to point Crane out. "I'm going to go restrain him," Robin says, taking a handful of cable ties from his belt. For most criminals it would be too many. "EMTs will be on scene any minute. With luck I can get them to sedate him while he's down." He is the one the paramedics are most likely to trust. That's what Robin does. "I'll take this side of the building," I say, pointing towards the front and looking at Tarantula. Robin, Catwoman and Onyx nod and move away, Robin towards Crane and Catwoman and Onyx toward the back of the building. Tarantula and I are clearly in costume, but Catwoman and Onyx are likely to be mistaken for real criminals by the police. 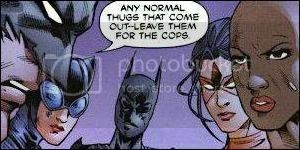 They also need to avoid being seen with me or Robin by real criminals. Especially Onyx. Better they should be back there. Also Robin thinks I am keeping Tarantula with me because I don't trust her. That is backwards. I can tell she is not "up to" anything, so I am staying with her so the others won't waste time watching her. We find one man with blackened clothes and a broken arm. His pupils say he has a... concussion. He says he is "just a delivery guy" but he is lying. Tarantula says she recognizes him from Black Mask's broadcast, when he was pointing a gun at a woman in a wheelchair. She is telling the truth. There is something... Barbara is her "baggage." I did not know they knew each other. I also don't know whether she knows Barbara as Barbara or as Oracle. I say nothing, just bind the man's wrists and ankles. He protests that I am hurting his arm. I stand and "loom" over him. Another Stephanie word. "You're a liar," Tarantula says, and kicks him in the leg. "And a coward." It's not a hard kick but I give her a sharp look anyway. She shrugs and moves on. We find one more of Black Mask's men at the side of the building near where one of the fire exits used to be. He is unconscious and still gripping his gun. I don't like the way Tarantula looks at the gun. I eject its clip and slip it into his pocket, then jam the gun's safety on in case there is a round chambered, careful not to disturb any fingerprints. She kneels beside me and binds his ankles, then pushes open one of his eyelids. "Probably passed out from smoke inhalation," she says. She knows what she is talking about. I have adjusted to my (probably) temporary hearing loss, and I hear the certainty and authority in her voice as much as I read it in her movements. I wonder where and when she was trained. She is new to the Tarantula costume still, but not to all our methods. Firefighters have just started spraying the few places in the pile of rubble where the clocktower used to be. There are paramedics headed in our direction. I gesture towards the back of the building with my chin. Tarantula nods, and we move to meet up with Onyx and Catwoman, using pieces of the destroyed building to stay out of sight from the rescue teams until we turn the back corner. They are waiting for us. "We found one guy trying to limp away," Onyx says. "He had the sense to stay down when we hit him." "He's wrapped up nice for the cops," Catwoman adds. I nod. "We found two." "All taken care of," Tarantula says, grinning with her hands on her hips. Sirens are growing louder. Some are fire and ambulance, but there is police backup coming too. We should go. "The police are coming back. Scatter," I tell the others. Catwoman and Onyx nod and move off, Catwoman towards a building with a fire escape not facing the ruins of the clocktower directly and Onyx towards an alley choked with dumpsters. Tarantula is watching me. "You're not going yet." "There might be more survivors." I wave my hand at where the clocktower used to be. "I can't leave yet." Her hand twitches towards an empty gun holster on her costume. She is worried about the police catching her. Not wanting to shoot at them if they try. Something else. She shakes her head. "I can't leave yet either." She needs to look for Barbara too. We climb up onto the pile of rubble. Lots of pieces are not stable and many places are still smoking. "Spiral search pattern," I say. Tarantula nods. "We'll overlap," she says, and moves away towards the back quadrant of the building. Leaving me the side. She won't give up on Barbara yet, but she doesn't mind letting the police try to catch me instead of her. It is hard to believe anyone could be alive under the big pieces of concrete. Even though I know that the bigger the pieces are the more likely someone is underneath. I see wires and cables sticking out of the rubble, and a shattered computer screen under the corner of a slab of wall. My stomach spasms. Tarantula and I cross our spirals three times, four, five. She looks grim now. She is shaken and trying to hide it. I think she has done this before and not found anyone alive. The air is so thick with smoke and dust I hear the rescue crew before I see them. They are following their own search pattern. Robin is near them, not quite with them, also searching. "Freeze!" someone shouts. "Robin, stop!" It is a man in a police officer's uniform. His gun is out and he rushes towards Robin. He is too careless on the heaps of rubble and it is only luck that he does not fall or cause a further collapse. I move toward them, careful of where I step and not to be seen, but the police officer is not even looking. Robin has turned to face the man. He holds his hands at his sides so that they are not hidden by his cape, but does not raise them. I move into Robin's line of sight. He ignores the cop and the gun and calls out, "Batgirl! Have you seen the others?" It is a show for the paramedics and firefighters. They have no orders to shoot us and many of them have had our help before. "They've already gone," I say. I gesture towards the back of the building. He knows I mean Onyx and Catwoman, and nods just a little. It's true. Rescue crews are here now and the police are coming in to look for us. But I am not ready to leave without finding Barbara yet. Robin is not the only one who can lie. "You promised you'd surrender!" the police officer yells. He is angry and no older than Nightwing. Inexperienced. Robin is not worried. I move into a cloud of dust when the man looks at him again. "We lied," Robin says calmly. He turns his back as if there is not a gun aimed at him, and bends down to shift aside something in the rubble. "Now get out of my way, while I look for survivors." He has raised his voice, as much so the rescue personnel as the police officer behind him can hear. "Better yet, pitch in." A few firefighters near them have straightened up and are glaring at the cop. He holsters his gun. I think I'm imagining it when I hear another voice say "Barbara Gordon?" But I look, and a man in a trenchcoat is bending over... I can't hear what they are saying, but a moment later he lifts something -- someone -- up. It is Barbara. I'm smiling so hard my mouth hurts and my eyes water. I barely notice when Batman stands up, not far from where Barbara was found. I retreat back and rendezvous with Tarantula's search pattern. She is worried when she sees me standing waiting for her. "They found her," I say. "She'll be all right." Tarantula doesn't say anything, just blinks and then nods. "We should go now." But now I'm not sure I should let her go off alone. Her body says all she's concerned with now is escape. From the police or us or both, I can't tell. There have been no new orders. "Come on," I say. We have better odds escaping hostile gunfire together. And we might find more metahuman criminals to round up. This is Gotham, after all. 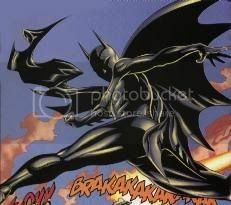 Reference images taken from BATMAN: OUTLAWS #2, the cover of DETECTIVE COMICS #794, and page 7 of BATMAN #633.